For some time now people have been asking me how I mount the camera on my airframes in order to achieve the results evident on my many videos. Although I have briefly covered the subject before, it seems a good time, after some eighteen months of experience in the subject, to report on my findings. In this period I have given up all my old cameras in favour of the GoPro Hero HD, the results from which are stunning; quite literally broadcast quality, as you can now see them being used by none other than the BBC. This quality comes with a slight downside, in that at 5.9 ozs (167g) it is more than four times heavier than my last Flycamone2, although, as I was to discover, used without its protective housing, the weight comes down to a more manageable 3.3 ozs (94g). So, just exactly what is it we want to see when we play back on the telly some time later? 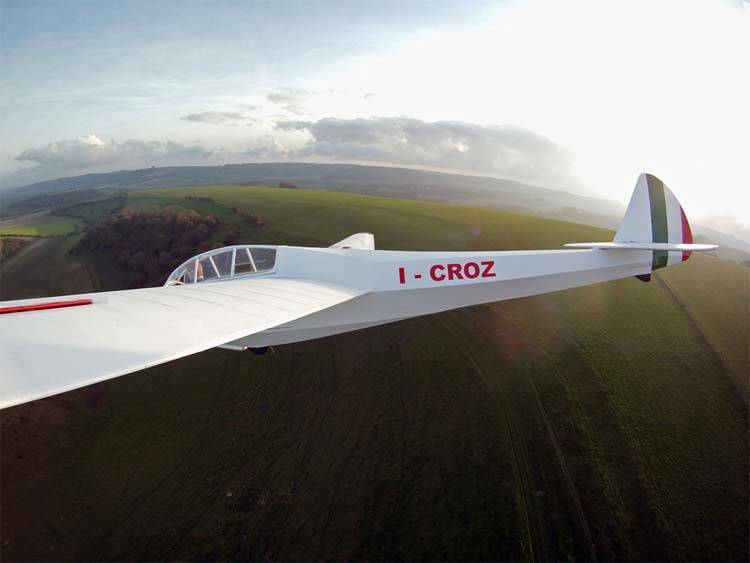 In full-size practice it would seem that the more of the airframe we can see the better, and the first way to achieve this is to use a camera with the widest possible lens. Now, some people are unable to process the distorted image that this produces, but to me this just adds more drama to the whole business, so if you are not one of the former, read on..
come into the picture, if you’ll pardon the pun, and here I have used only the sort of inexpensive items you might find hanging around in the workshop. 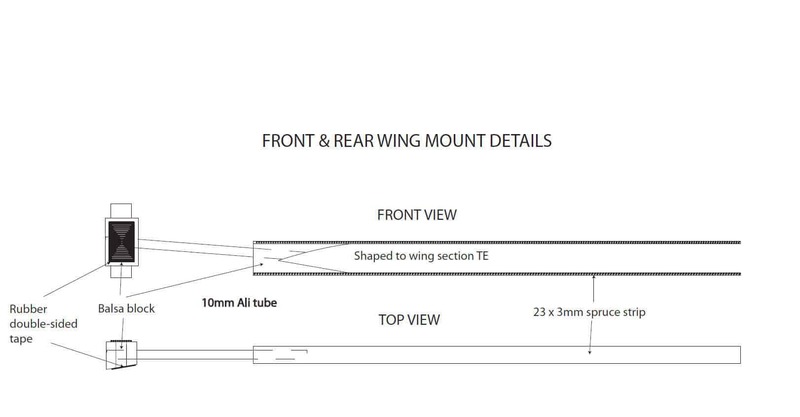 First, though, let’s start with the plastic display base that comes with the camera; this is very easily modified to make up a wing-mounted base. sticking on door moulding and the like. 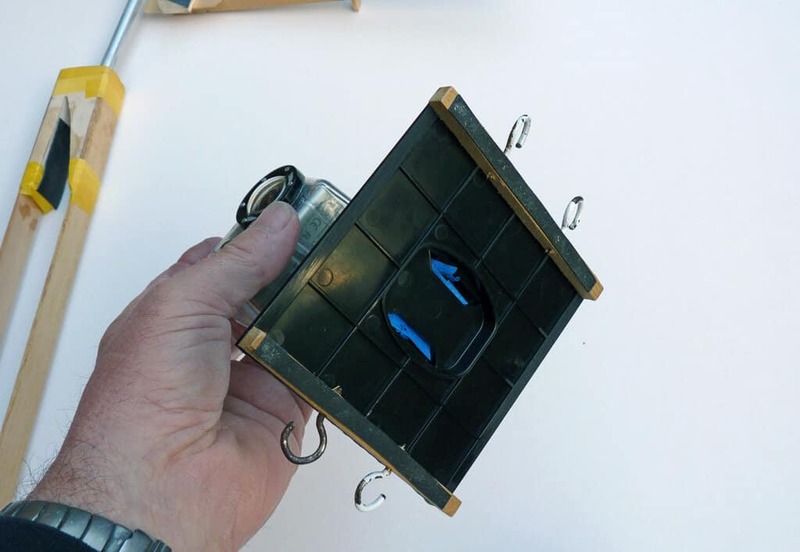 This is attached the inside edges of the shaped block, and also to the plate upon which the camera will be placed. Once thumbed into place, the protective plastic coating is pulled off and the sticky surface well thumbed over to remove seventy-five percent of its stickiness. Now you will find that the surfaces thus taped will want to stay where they are put, as will the camera, but without the removal trauma that would occur if they were left fully sticky. When the first results from this mount were previewed I must admit to being pretty chuffed; it really did look as though the footage had been obtained by the cameraman on a chase plane driven by a particularly suicidal pilot. 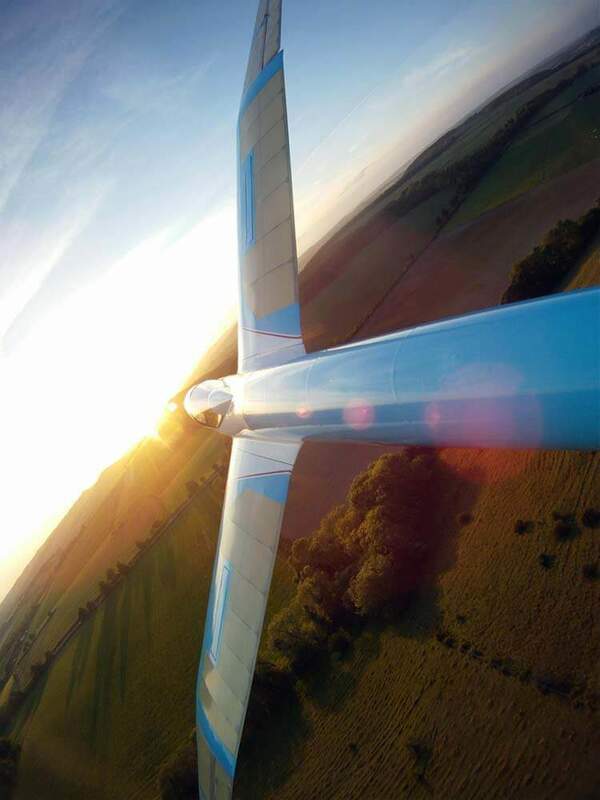 Until recently, this was my favourite mount until one day it occurred to me to turn it around 180 degrees to see what sort of view could be obtained from behind the wing’s trailing edge. Once again, it looked like the same self-destructive pilot was flying in formation, but the footage was a trifle wobbly. This led the production of the next generation mount, the No-it’s-Not-A-Sidewinder mount. This time, the balsa part is shaped to the trailing edge, and the wooden strips taped together at the leading edge. (Aluminium tube this time, I’d run out of carbon) This mount seems to work well either way round, although whatever material you use for the rod, the maximum length seems to be around 180mm, as the use of any longer will lead to some distracting camera wobble. 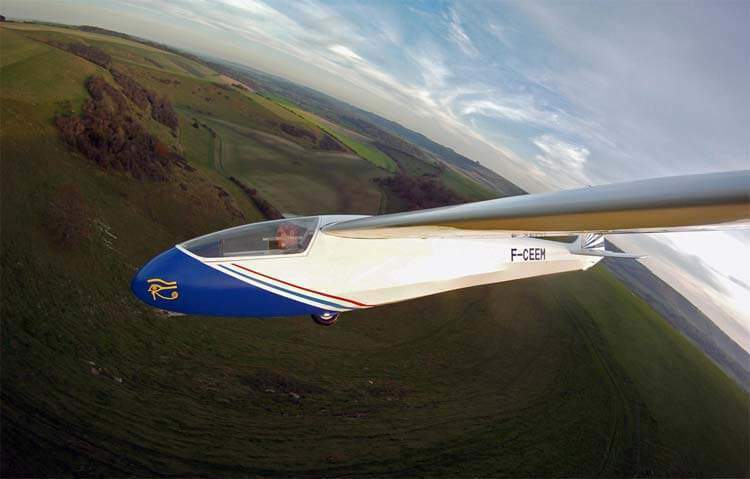 The view from the rear is best obtained with the camera set up on top of the fin, as this can give you almost the whole airframe on the screen, although with its concomitant distortion, of course. 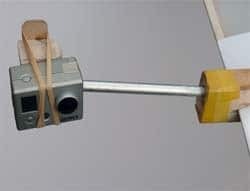 Once again, the mount is a simple affair, with two strips of spruce joined together at the top, with a small strip placed horizontally to allow it to be taped to the fin. If you have a model with an aerodynamically balanced rudder, ie the whole of the top moves, then you have a problem, as the point-of-view swerves manically left-to-right with the movements of the rudder, thus inducing feeling of nausea in the viewer. The answer is to make up another mount that will sit on the top of the fuselage with a pole long enough to raise it as high as possible. 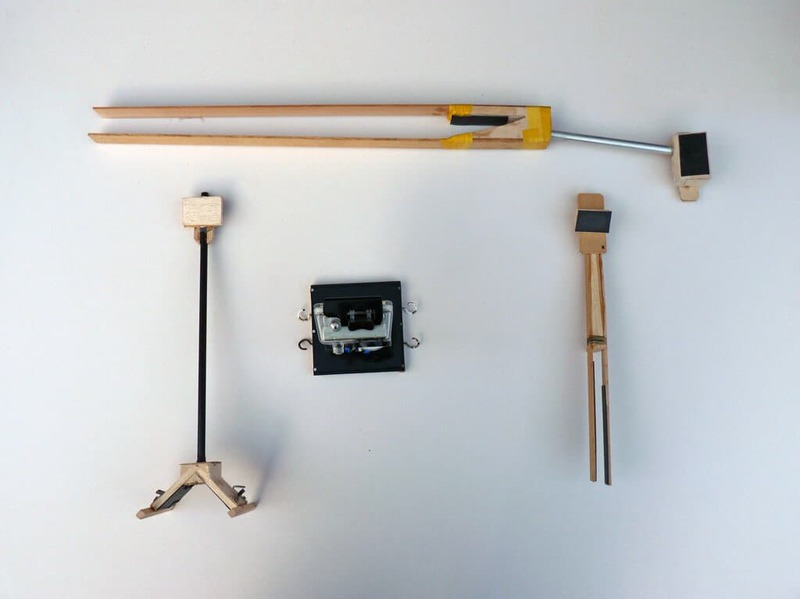 Once again, ply, balsa and rubber bands make the up the cost-effective solution. 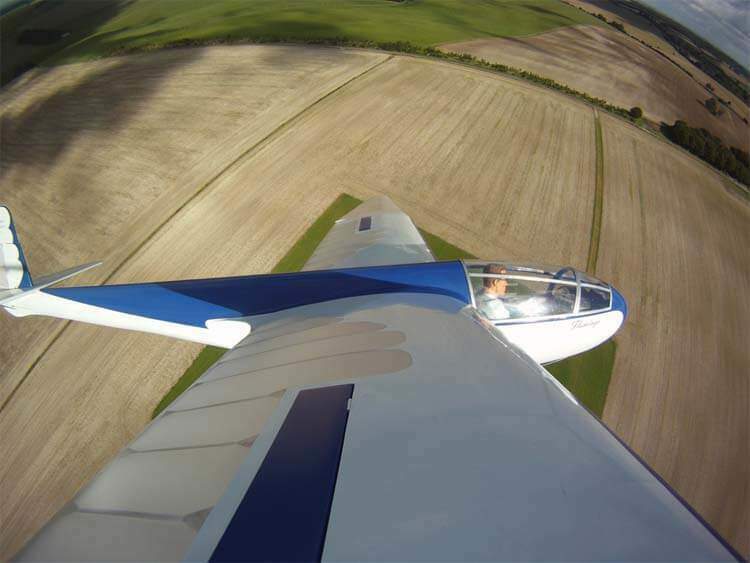 There is on obvious problem associated with putting the camera at the rear of the aircraft, and that involves the rearward shift of the centre of gravity. 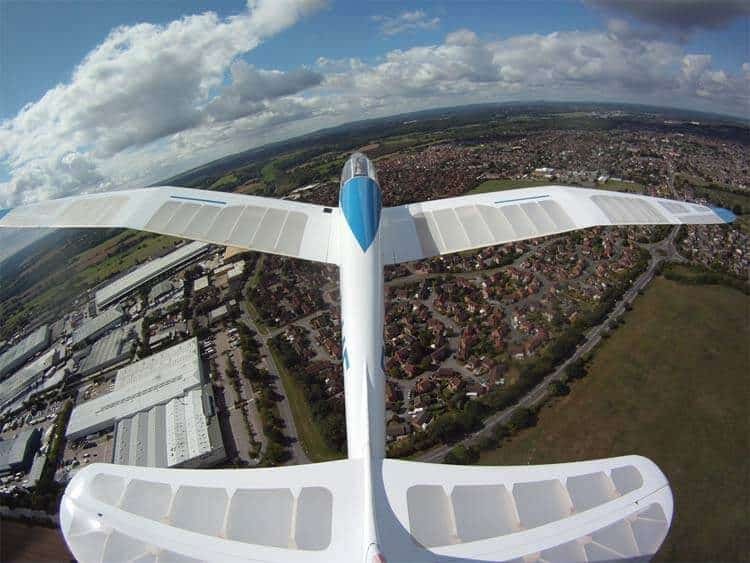 On my gliders, with their HQ wing sections famous for their good handling qualities at low speed, the change is quite noticeable, needing a certain amount of down trim, but the models remaining safely flyable. (The more cautious among you might wish to add more weight to the nose of the aircraft.) 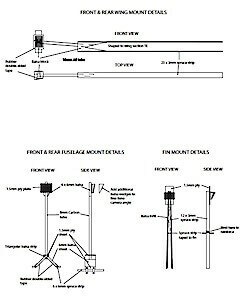 The same mount can also be used to place the camera on the front of the model. 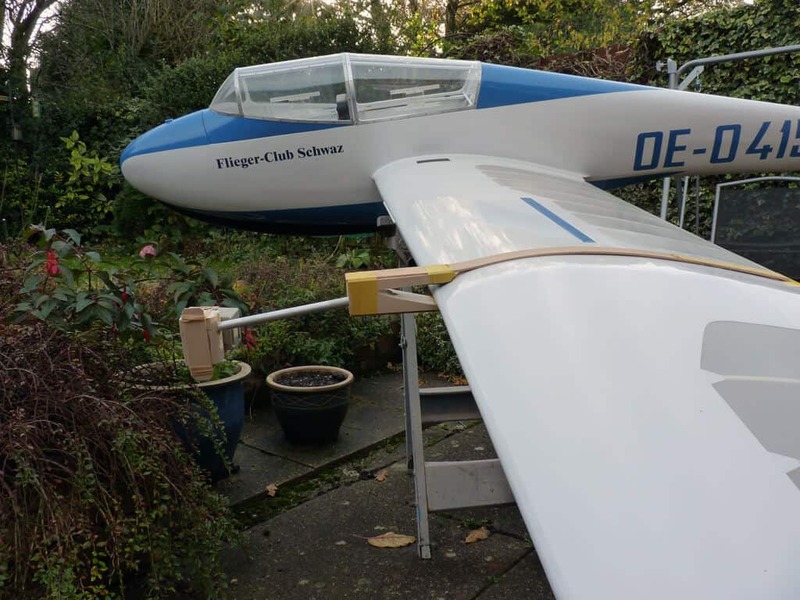 The problem here is that the decreasing curves can cause the rubber bands to slip forwards, although I have found that loosening a screw in the landing skid provides a handy stop. 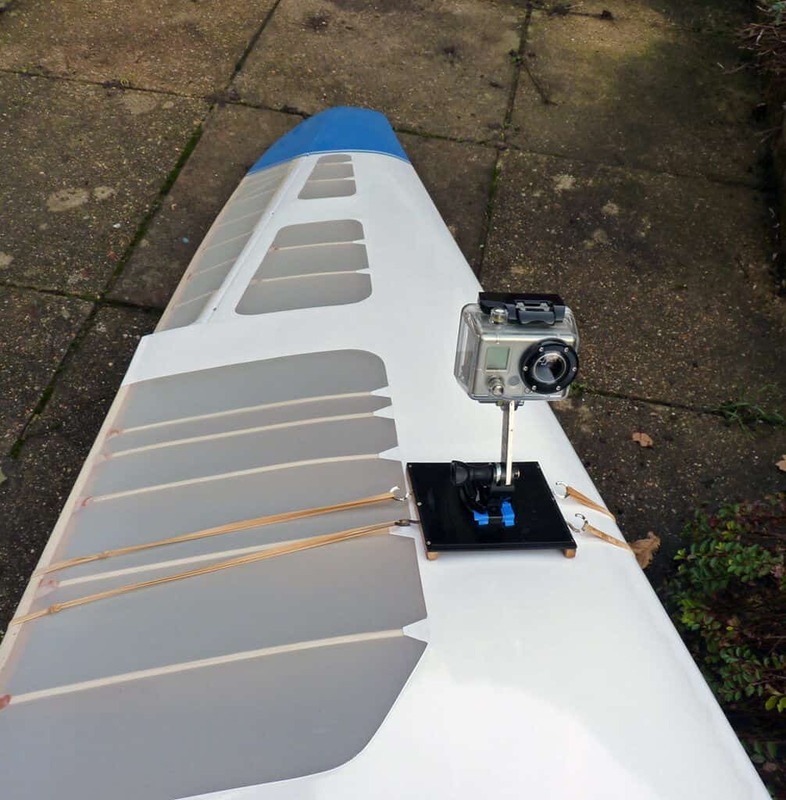 Once again, though, insulating tape provides a belt-and-braces fix, but you will need a wedge of some sort to get the camera to point down towards the airframe. 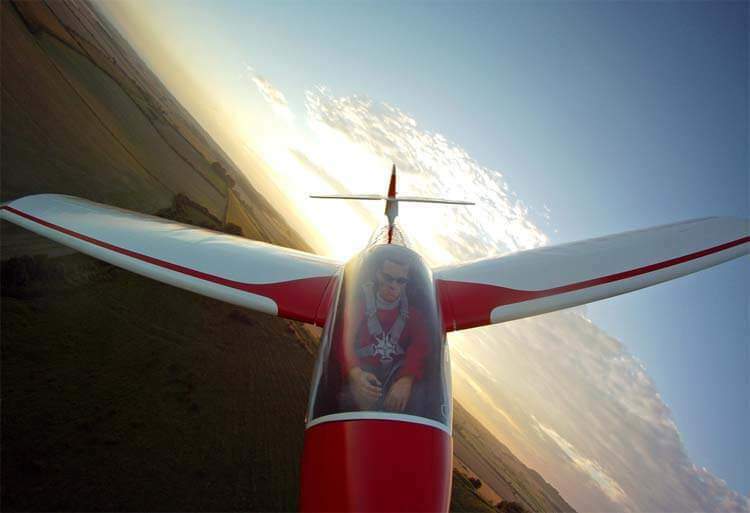 Before you even think of venturing out to the flying field, you need to know whether your camera is pointing in the right direction each time, and make sure that parts of the mount aren’t in the frame, and there are two ways to go about that. Most of these mini-cameras have a photo taking function, so you can set up each mount at home, take pics with the camera, and adjust accordingly until you feel you have got it right. There is a much better solution with the GoPro, though, and that involves the BacPac accessory. This is a small LCD screen that clips to the back of the camera and allows you to see just what you are doing, as well as review the pics and footage you get before you go home and its too late. There is one more mount you might need in order to take ground-to-air footage of your model, and this time it needs to sit on your head. This is simplicity itself, as all you need is a cycle helmet and one of the immensely strong self adhesive pads that come with the camera. Having fired the camera up, you will need then to fly close passes to yourself, remembering that the wide angle lens ensures that the model is in the frame, but that it will also seem a long way away. I have found that filming my models in action from the air and from the ground is a fascinating pastime all by itself, to the extent that flying and filming have now become inextricably linked. The advent of Smart Tellies now means that your videos can now be dropped onto a USB memory stick and plugged directly into the back of your set, which means that as the winter winds howl outside in the darkness, as a couch potato you can re-live those summer sessions over and over again.